The arrival of 1977 saw the release of two important films – Eraserhead and Star Wars. Both films couldn’t be more different visually or thematically, and yet they share a common bond in the sense that each features a filmmaker with a unique vision. Lucas made a wildly popular film that appealed to a mass audience, while Lynch created an intensely personal film that attracted a small, but devoted group of admirers. Interestingly enough, these two films were so captivating and distinctive that they would entice people to watch them repeatedly but for entirely different reasons. However, where Lucas’ film is essentially an homage to the works of other filmmakers and films that he admired – albeit given a unique spin to make it his own, Lynch’s film remains truly original and as fresh and innovative as it did when it first appeared at its midnight screening premiere at the Filmex in Los Angeles. Eraserhead is an urban nightmare set in an industrial wasteland “reminiscent of the paintings of the Swiss surrealist H.R. Giger” whose works contain images of decaying biological matter and people trapped in machinery, becoming one with industry, much like Lynch’s film with its bleak landscapes of buildings and factories with no signs of nature present. The motion picture’s protagonist, Henry Spencer (Nance) is a rather odd fellow who wears a black suit with a white pocket protector and white socks to match, his hair styled like some sort of electrified pompadour a la the Bride of Frankenstein (1935). As the film opens, we gradually learn that Henry is on vacation from La Pelle’s factory and after a particularly gruesome and rather humorous dinner with his girlfriend Mary X and her strange family, he learns that she has given birth to a premature baby. The rest of the film shows how Henry comes to terms with this situation and copes with all of the problems inherit in rearing a child in an area that can only be referred to as an urban hell. Now this all sounds pretty straight forward right? Well, Eraserhead doesn’t quite play out in this linear fashion. The film follows its own leisurely pace in order to let the rather nightmarish mood and creepy atmosphere slowly work its magic on the viewer. And this is where the film loses or keeps its audience. You are either captivated by its often disturbing, yet somewhat beautiful images, or repulsed by its rather negative and pessimistic worldview. 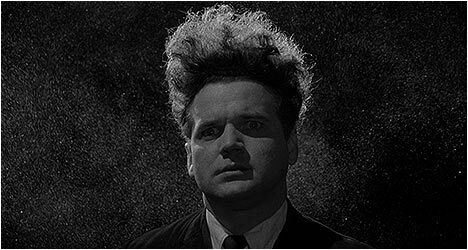 Either way, Eraserhead is an unforgettable film guaranteed to provoke a strong reaction, which is what a good film should do. So what is Eraserhead’s legacy? Well, for one thing it launched David Lynch’s career. Mel Brooks saw Eraserhead a few years after its debut and tagged Lynch with that famous moniker, “Jimmy Stewart from Mars.” Brooks was so impressed with Lynch’s film that he met the filmmaker and offered him a chance to direct The Elephant Man (1980). Lynch hasn’t looked back since, continuing to release one intriguing film after another. Yet, none of them, with the possible exception of Blue Velvet, have been able to surpass the originality and sui generis of Eraserhead. All of Lynch’s subsequent work contains echoes of this film, from the unsettling, dimly-lit hallways of Dorothy Vallens’ apartment building in Blue Velvet (1986), to the famous dream sequence in Twin Peaks. All of these moments of surreal brilliance and creepy dread can be traced back to Lynch’s first feature film. This David Lynch-approved Blu-Ray transfer wipes the floor with all other pre-existing versions and really shows off Frederick Elmes’ atmospheric black and white cinematography. Good news for those that bought the Lynch self-released DVD back in 2001, all of the extras on that edition have been ported over with a wealth of other stuff, including the collection of short films the director released on his official website years ago. “1979” is an archival interview with Lynch and Elmes for a television production class at UCLA. The director talks about why he picked the locations for the film and the contrasting reactions it received at its premiere. In what amounts to a “Thank you” message by Lynch, “1982” is an archival trailer for the film when it screened at the Nuart Theatre in Los Angeles for years at sold-out Friday midnight movie screenings. “1988” features an excerpt from an excellent French T.V. program about Lynch’s films. A camera crew follows Lynch and his leading man Jack Nance as they check out one of the iconic locations from the film. “1997” features an excerpt from Toby Keeler’s documentary Pretty as a Picture: The Art of David Lynch. Lynch, his assistant Catherine Coulson and actors Nance and Charlotte Stewart reminisce about making Eraserhead. The most substantial extra is “2001,” which was included on the 2001 DVD as “Eraserhead Stories.” For almost 90 minutes, Lynch talks about the long production history of the film with all kinds of fascinating anecdotes intercut with a significant number of archival stills and photographs. Exclusive to this edition is “2014,” a collection of interviews with Coulson, Stewart, Elmes and actress Judith Anna Roberts. They talk about their initial impressions of Lynch and what it was like to work on Eraserhead. “Short Films” is another bonus for die hard fans as we get 2K restorations of six shorts directed by Lynch that include Six Men Getting Sick, his first experiment with film, The Alphabet, The Grandmother, two version of The Amputee and the brief but eerie Premonitions Following an Evil Deed. They all look great and it is interesting to see how the first five all informed Eraserhead to a certain degree. The article includes a link to my lengthy analysis and complete script transcription, with annotations. Doing a transcription was the only way I could understand the film.